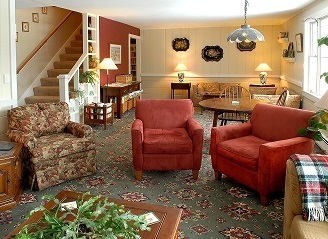 We have 13 individually-decorated guest accommodations at Deerhill Inn - unique, comfortable, elegant and welcoming. Rooms and Suites all offer microfiber robes, luxury linens, toiletries by L'Occitane, CD players, free access to reliable high-speed wireless Internet and complimentary house-baked cookies and bottled Vermont waters. In addition, Suites and Enhanced Rooms feature single or double whirlpool tubs, TVs with DVD players and cable service, and cozy gas fireplaces. Although our hillside breezes keep the Inn cool in summer, from May to September many of our rooms have discreet air conditioning units for guests who prefer this. 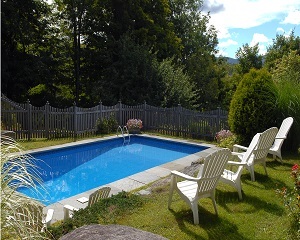 There are stunning views of the Green Mountains, and private decks leading into the lovely gardens and overlooking our secluded and peaceful pool. To make your stay extra-special, choose one of our in-room Deerhill Indulgences - or for a special occasion - or "just because" - book the perfect Deerhill Package. Our two-room suite on the first floor of the balcony wing with King bed, sitting area with sofa, private two-person jacuzzi tub with separate tub/shower, two widescreen TVs with Cable & DVD players, Bluetooth audio system, gas fireplace, air conditioning & mountain views. With its own entrance just a short, sheltered step from the side door of the Inn, it's like having your own personal cottage with all the amenities of Deerhill Inn! 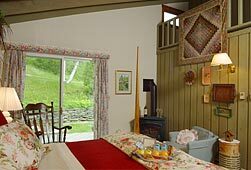 Located on the ground floor of the Balcony Wing, Garden Suite is private and cozy with elegant rustic décor and sensational views from both rooms of the main range of the Green Mountains across the beautiful wooded Deerfield Valley. 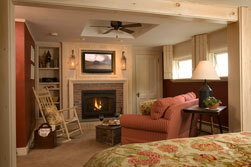 The Suite features a King Bed, large two-person Jacuzzi tub, and separate sitting area with sofa and fireplace. In Summer the Suite is fitted with air-conditioning. Both rooms have a TV with DVD player and Cable service and there's a private bathroom with tub-shower. If you're looking for a special place to be "alone together" - this is it! 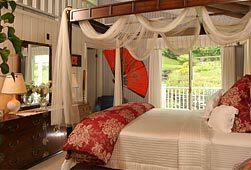 Our junior suite on the second floor of the main Inn with King bed, sitting area with sofa, private bathroom featuring two-person jetted tub with rainforest shower, TV with Cable & DVD player, Bluetooth audio system, gas fireplace, air conditioning & mountain views. A junior suite on the second floor of the Main Inn, Tamarack is a guest favorite with its elegant Adirondack-themed décor, Mountain views, stunning refitted bathroom with deep two-person jetted tub/shower and extra-large King bed. In Winter, curl up by the fireplace and watch cable TV or one of our selection of classic DVDs from the comfort of the sofa or rocking chair; in Summer the Suite is fitted with air-conditioning, and there's a little tucked-away deck furnished with table and chairs leading into the garden and up to the pool. Tamarack offers comfort and romance in every season. Our junior suite on the third floor of the main Inn with King bed, sitting area with Queen-sized sofabed, private bathroom with tub/shower, widescreen TV with Cable & DVD player, Bluetooth audio system, gas fireplace, air conditioning & garden views. 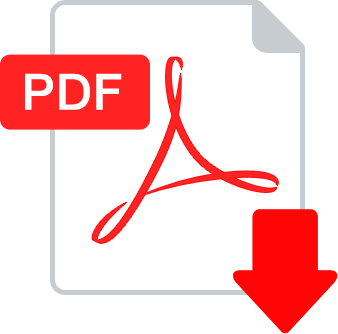 A supplement of $35 per guest per night is added for greater than double occupancy. Country-modern in theme, this spacious Suite on the third floor of the Main Inn accommodates two, three or four guests in complete comfort with a King bed, a new full-size pull out sofa, a rocking chair and an armchair. There's a large wide-screen TV with cable service and DVD player, a music system with iPod dock, an elegant gas fireplace, and garden and tree-top views. The private bath has a tub/shower and in Summer the Suite is fitted with air-conditioning. 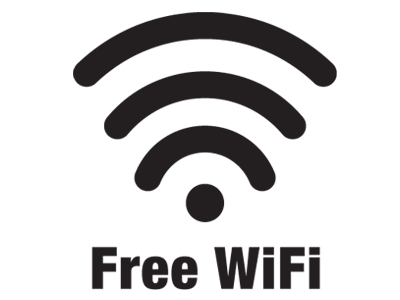 White Pine offers a private retreat for couples or a comfortable option for a family of three or four travelling together. Please note that we welcome young people over 12 years old to the Inn, but our accommodation is not suitable for younger children. Beautifully-decorated rooms with luxury amenities including fireplace, whirlpool tub, TV with Cable & DVD player and balcony or deck. The three Enhanced Rooms on the second floor of the Balcony Wing offer stunning views of the Green Mountains - snow-covered ski-slopes in Winter, deep green Valley views in Summer and incredible Fall Foliage. Access to the large covered Balcony is by way of both inside and outside stairs and guests can enjoy the view from comfortable porch rockers while sipping a lemonade or cocktail, then star-gaze as evening falls. A third staircase leads to the back garden and the pool. Second floor of the balcony wing with King bed, private bathroom featuring a jetted bathtub with shower, widescreen TV with Cable & DVD player, Bluetooth audio system, gas fireplace, air conditioning & mountain views. Located at the end of the Balcony Wing, Evergreen is quite private. Its leafy green country modern décor compliments the tree-top view from the two perfectly-placed armchairs through the picture window. 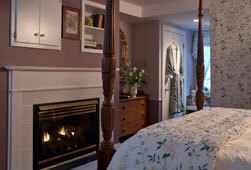 There's a comfortable King bed, a cozy fireplace and a private bath with single-person jetted tub/shower. In the warmer months, Evergreen is fitted with a discreet air conditioning unit. Cool in Summer and snug in Winter, Evergreen in an all-season favorite. Second floor of the balcony wing with Queen bed, private bathroom featuring a jetted bathtub with shower, widescreen TV with Cable & DVD player, Bluetooth audio system, gas fireplace, air conditioning & mountain views. Largest of the Balcony Rooms, Apple Blossom has a traditional feel with its beautiful antique tall boy, lovely canopy bed and armchairs each side of the fireplace. There's a comfy "nook" for reading, napping or just curling up, and the private bath has a single-person jetted tub/shower. A picture window frames a memorable view of Green Mountain ski slopes. In the warmer months, Apple Blossom is fitted with a discreet air conditioning unit. Second floor of the balcony wing with Queen bed, private bathroom featuring a jetted bathtub with shower, TV with Cable & DVD player, Bluetooth audio system, gas fireplace, air conditioning & mountain views. With its elegant post bed and pretty flowered décor Sugar Maple has a "country house" feel and guests enjoy the wonderful view from a pair of comfortable armchairs. On a Winter evening relish the warmth of your fireplace then relax in your jetted tub. In the Summer, you'll enjoy pleasant breezes all day long thanks to a second window opening on to the back garden. Sugar Maple is a romantic haven at any time of year! Our two Main Inn Enhanced Rooms are side-by-side on the second floor, accessed by a gradual staircase with a good handrail. Conveniently located for the small Library, the large Upstairs Sitting Room and the ground floor Restaurant, the rooms are well-suited to friends travelling together but private enough for couples who would like to be alone. 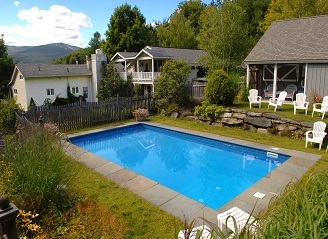 Both rooms have walk-out access to the gardens and pool from private decks furnished with table and chairs. Second floor of the main Inn with Queen bed, private bathroom featuring a large jetted bathtub with rainforest shower, large widescreen TV with Cable & DVD player, Bluetooth audio system, gas fireplace, air conditioning, furnished deck & garden views. Taking its name from the soft blue of the walls, Delphinium has a genuine New England ambience. A small entrance-way leads to a light-filled guestroom. There's a Queen-sized bed with painted iron bedstead, a newly-refitted private bath with deep two-person jetted tub/shower and a discreet TV with Cable & DVD player. Air-conditioned in Summer, the fireplace keeps the room cozy in Winter and the deck leads out into the pretty gardens and a path up to the pool. 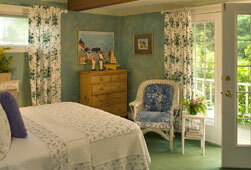 Delphinium is popular with guests seeking a romantic getaway, or just a pretty place to spend time together. Second floor of the main Inn with Queen bed, private bathroom featuring a large jetted bathtub with rainforest shower, TV with Cable & DVD player, Bluetooth audio system, gas stove fireplace, air conditioning, furnished deck & garden views. 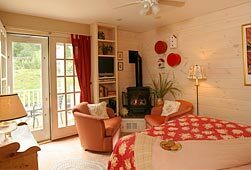 A smaller room with striking country-modern décor, Dahlia has a newly-refitted bathroom with a large jetted tub, a comfortable Queen bed and a quaint cast-iron stove with two comfortable chairs. Air-conditioned in Summer, the French doors lead to a private deck in the garden and a path to the pool. There's a TV with cable service and a player to enjoy DVDs from the selection in the Upstairs Sitting Room near-by. Second floor of the main Inn with King bed, private bathroom with tub/shower, gas stove fireplace, air conditioning, furnished deck & garden views. A quiet and private room at the back of the Inn, Magnolia was the bedroom of one of the daughters of the house and still features her pretty, country-style furniture. There's something of the feel of an Alpine lodge to Magnolia, with its King-sized post bed, cast-iron gas stove and barn-board walls. The private bath has a tub/shower, and a private deck with views of the lawns and gardens leads to the path round the back of the Inn to the pool. 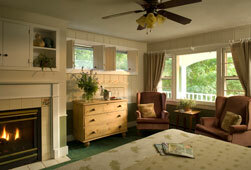 Second floor of the main Inn with Queen bed, private bathroom with tub/shower, furnished deck & garden views. Opposite Magnolia at the back of the Inn on the second floor, Orchid's elegant, Asian-inspired décor is always popular with guests seeking a romantic retreat. Antique furniture and a handsome Queen bed with hangings compliment matching walls and soft furnishings with pretty lamps. The private deck leads into the garden and the path to the pool, and the private bath has a tub/shower. An extra-large closet makes this room popular with travelling guests. 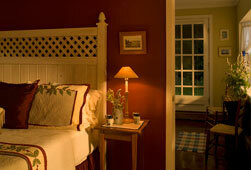 Second floor of the main Inn with Queen bed, private bathroom with shower, furnished deck & garden views. A charming "garden room" on the second floor, Lilac is at the end of the hallway leading past the Library. With elegant, floral décor and quaint, unusual touches, Lilac has a Queen bed, its own small entryway and private bath with full-sized walk-in shower. The room suits guests who appreciate the pretty furnished deck leading into the side garden with its views of the woods and access to the pool steps. Third floor of the main Inn with Queen bed, private bathroom with tub/shower, air conditioning, furnished deck & garden views. On the third floor at the end of the hallway, Azalea is quiet and private. 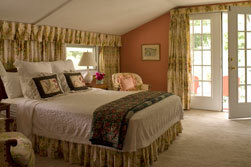 It's a larger room, with a Queen bed, elegant antique furniture and pretty floral textiles. A large covered deck is furnished with wicker chairs, tables and a rocking chair with views over the side garden and towards the pool - there's even a glimpse of the Green Mountains over the rooftops. 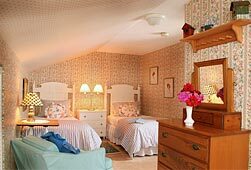 Azalea is a popular room with guests who are traveling with another couple or older children, as they can gather on the deck together. Couples who prefer to be alone appreciate the room's private location, too, and the lovely summer and winter views of the woods and the gardens. The small private bath has a tub/shower. 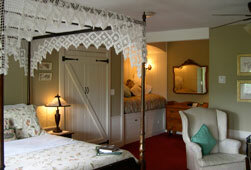 Third floor of the main Inn with two Twin beds and private bathroom with shower. On the third floor of the Inn with its twin beds and quaint, traditional décor, Bluebird reminds us of holidays at Grandma's house! With a full-sized walk-in shower in the private bath and a rocker and armchair it has all the comforts of home on a small scale. Often reserved together with either Azalea or White Pine Suite to accommodate families with older children or other relatives in the party, Bluebird is also popular with friends travelling together or a parent travelling with an older child. Couples who prefer twin beds also choose this room, which offers the opportunity to stay at Deerhill Inn for guests who prefer more modestly-priced accommodation. 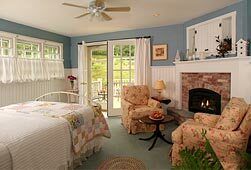 There are two Sitting Rooms at Deerhill Inn, on the first and second floors, and guests who would like a change of scene from their guestroom are always most welcome in the common areas of the Inn. The First Floor Sitting Room, with its log fireplace and views of the Mountains is comfortably furnished with rockers, armchairs, a large sofa and a beautiful copper table. It's conveniently located near our little Bar for guests to enjoy Afternoon Tea, or a cocktail or glass of wine before dinner. The Sitting Room on the second floor is a large room with sofas, tables, comfortable chairs and a splendid view of Haystack Mountain. 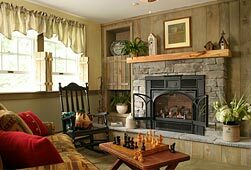 There's a log fireplace, a selection of magazines and games of all kinds, and room for everyone to relax. Convenient to the small Library, it's just the place to curl up in the afternoon with a book on a big sofa under a cozy throw; to gather with friends for a chat before dinner; or to finish the evening together in the firelight with a nightcap. 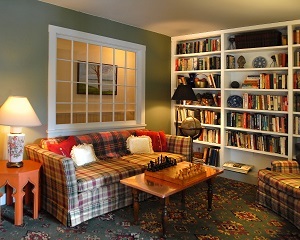 Our small Library has a collection of reading material gathered over many years by different owners of the Inn, a comfortable sofa and chair and a very popular chess-board - the scene of some epic battles!